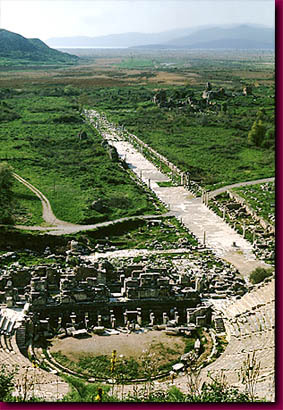 The amphitheater of Efes. This view from atop its 15,000 seat amphitheater looks down upon its once columned marble avenue that led to its Aegean harbor. The silting in of the harbor lead to Efes' decline. The waters of the Aegean now can be barely seen in front of the last line of mountains. The most magnificent ancient ruins I have ever experienced are those of Efes in modern day Turkey. This Greco-Roman city, which was home to as many as 250,000 people at its zenith, once imprisoned the Apostle Paul whose biblical Letter to the Ephesians perpetuates the name of this totally abandoned site.